UCHE JOMBO NO LONGER WITH THE 4-GIRL GROUP? Nigeria’s only 4-girl group consists of Uche Jombo, Omoni Oboli, Chioma Akpotha and ufuoma mcdermott. They were all colleagues until one day they rolled out photos announcing them as Nigeria’s only 4-girl group! They became so close that they acted in movies together, go on vacations together and practically couldn’t have a week go by without coming together.So many of their colleagues were happy for them, that they found EACH OTHER, while some became envious, and the ‘sisters’ even sometimes take a swipe at them saying they are unbreakable. Trouble however began when Uche collaborated with Ini Edo to drop a movie, her latest film, and Omoni Oboli was MISSING FROM THE PREMIERE. What? How?? Then Nigerians started digging… and before they could dig afar, Ini Edo helped out by calling out Omoni saying she is indeed a ‘good’ friend for snubbing Uche’s movie premiere. Long story cut short, Omoni hasn’t been seen with Uche since then and Uche hasn’t been seen with the girl-group either. So over the weekend, Omoni and Chioma went to Ufuoma who has been under the weather. 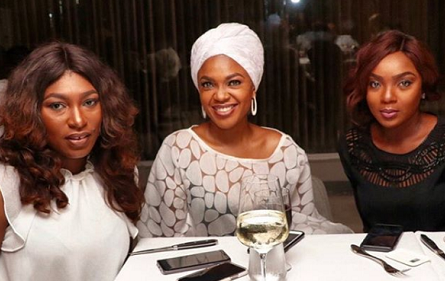 Ufuoma brought the gist on instagram, with Uche Jombo clearly missing from the photo, but no words from the girls, which shows she is not being missing. Many are now concluding the one time bubbling 4-girl group without mincing words can now be addressed as a 3-girl group as Uche Jombo as bowed out.